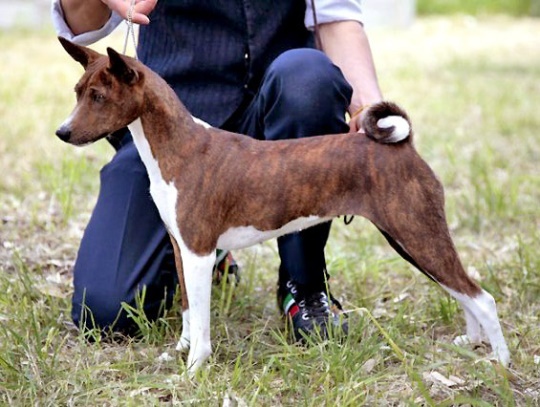 The Basenji – A compact, alert hunting companion! The Basenji is a highly intelligent, compact, and seemingly “barkless” dog breed. His intelligence is only matched by his intense sense of sight and smell. This pooch may be short in physical size, but he is huge in endearment. If you and your family can stay a step ahead of him, then the Basenji may be the dog breed for you! The Basenji has also been referred to as African Bush Dogs and Congo Terriers. The Basenji is one of the oldest dog varieties in the world. 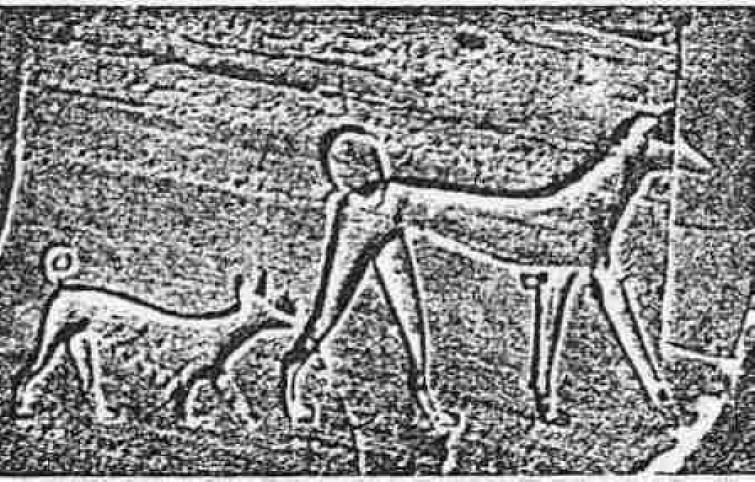 In fact, cave paintings of the breed have been discovered, and they appear to be from around 6,000 B.C. in Ancient Libya. The Basenji has been forever immortalized by the Ancient Egyptian relics from 3,000 B.C. Even back then; the Basenji was a loyal hunting companion that substantially increased food quantity for the villages. Explorers discovered that the Basenji was a favorite companion to the Pygmies in the African Congo. The Basenji was eventually brought to Europe around the year 1880. They were known back then as Congo Terriers or African Bush Dogs. A great deal of the Basenjis that were brought to Europe from Africa became ill with distemper and ultimately lost their lives to it. The vaccine for distemper had not yet been developed. Basenjis were not directly brought from Africa to the United States until 1941. The first known Basenji to set paw on American soil was a white and brindle colored female, named Congo. Congo was a stowaway on a ship that was importing coffee to the United States. Congo was not only the first Basenji to come to America, but she was also the first to obtain the obedience title in 1942. The Basenji dog breed is considered to be a member of the Hound Dog Group. Hound Dogs are first and foremost hunting companions. Their natural instincts are to be on alert for intruders, retrieve fallen game, or hunting game themselves. The Basenji is no different! Don’t let their small stature fool you! They are serious hunting companions! The average Basenji stands about one foot to a foot and a half tall, and they typically weigh between 20 and 25 pounds. Their compact size comes in handy when hunting smaller game such as rodents, fox, rabbits, and weasels. If a Basenji is properly cared for, they should live a nice long life between 10 years to 15 years old. When you gaze upon a Basenji dog, you may notice that their coats are short and fine in texture. You may also see that their coats can come in a variety of colors and patterns including black, red, brindle, or tricolor. A true Basenji should have all white feet, a white tip of his tail, and various other white throughout his legs, body, and face. A Basenji’s tail is unique in that it curls upwards towards his back. Hounds, like the Basenji, are smart, incredibly independent, and very alert. However, the Basenji is not all work and no play! He can also be very loving, affectionate, and loyal to their family members. A Basenji puppy should be enrolled in puppy boot camp or another type of training and socialization program. Without early training and socialization, you may have a timid, stubborn, and awkward pooch. Consistency and kindness are essential training tools for this dog breed. The Basenji reacts well to positive reinforcement, treat training, and lots of praise! If the professional dog trainer or a family member is too harsh with a Basenji, then the pup will likely become stubborn and rude. This particular dog breed is full of energy that is very task driven. By this, I mean that if you train your Basenji to fetch the newspaper in the morning, then he will happily do so. If you teach him that rabbits and squirrels are not welcome in your garden, then he will enthusiastically be on alert for those pesky pests. Basenjis can be wonderful family pets if they are raised alongside children and other animals. They will likely not be welcoming to any changes or new additions to the family dynamic. Young children should be supervised and taught how to act around a Basenji as well as the best ways to play with him. A household with hamsters, rabbits, cats, ferrets, or other small pets should reconsider bringing home a Basenji as his natural instincts will tell him to chase and attack the “prey”. As part of the Hound Group, the Basenji requires extensive daily exercise. This should include long walks, jogging on a wooded path, or going on a hunt. Basenjis should never be allowed off leash or unattended in the backyard. Even if you have installed a secure fence to keep him in, a Basenji will always find a way out! His size, barklessness, and the need for constant supervision while outdoors makes him ideal for an apartment living situation. Most apartments do not have fenced green space for dogs to be let off leash. Therefore, your Basenji would be safe and just like any other dog while on a leash. It is also interesting to note that Basenjis do not enjoy rainy days outside. They can become stubborn and even disrespectful towards their owners if they are made to go outside in the rain. Basenjis are unique in that they groom themselves, similarly to cats. He may require tub bathing once every few months or so and may only need to be brushed once every few weeks. However, you should take care of his teeth by brushing them two to three times each week. If your Basenji allows you to brush his teeth more frequently, then it is wise to do so to prevent gum diseases. Basenjis should be fed approximately half of a cup of kibble twice a day (one cup of kibble each day). You should choose a kibble that is formulated for smaller dog breeds with high energy. As he ages, you may need to switch to a Senior Dog Formula. Be sure not to overfeed your Basenji as he could become overweight.